Lisburn's population in 1861 was 7,484 and there were 1,220 houses in the town. This is compared with 1911 when the population was 12,388 and the houses numbered 2,630. Lord Conway died in 1683 without an heir and left his Irish estate to Colonel Seymour who took the name Seymour Conway. In 1872 Sir Richard Wallace succeeded to the estate, after a long and costly litagation with Sir Hamilton Seymour. This supplement was specially compiled to commemorate the granting of Borough Status to Lisburn and was issued free with the Ulster Star, Saturday, June 11, 1964. It was edited by Stanley Maxwell who takes this opportunity to thank all those who assisted him in his research, and makes mention of the contributors who wrote articles of a specialised nature. Front cover picture was taken by George Henry, from an old print, and other photographs were taken by staff man, John Bell. Advertising was designed by Charles Hunniford, and the supplement was printed Web-Offset by Morton Newspapers Ltd., Lurgan. 4-REV. 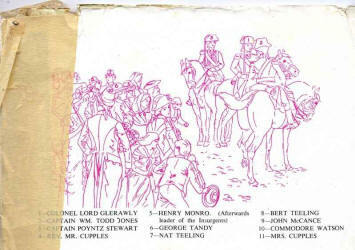 MR. CUPPLES 5-HENRY MONRO. (Afterwards leader of the Insurgents). 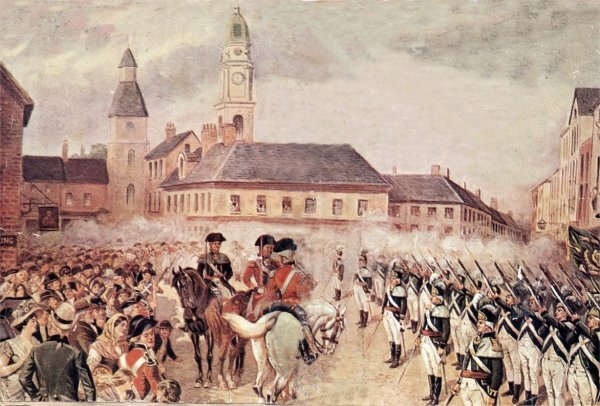 Our cover picture shows a parade of the Lisburn Volunteers in the Market Square in 1782. 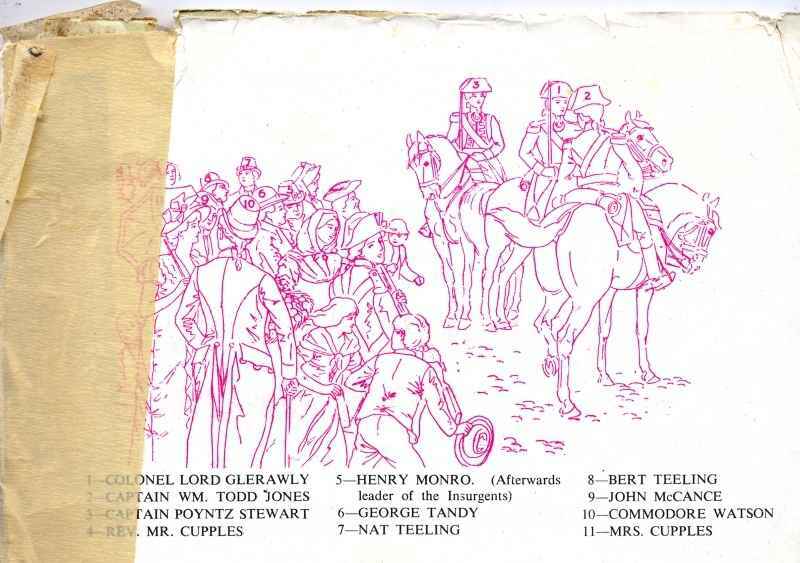 An inspection is being carried out by Colonel Lord Glerawley, Commanding Officer of the County Down Volunteer Forces, the centre figure of the group of mounted officers. The key identifies the various local celebrities who mingle with the crowd. Lisburn contributed largely to the Volunteer forces of Ireland and the following is a more or less complete list of companies raised locally--Lisburn Light Infantry, Lisburn Grenadiers, Lisburn ' True Blues, Lisburn Fusiliers, Lambeg Infantry, Dunmurry Infantry a nd Drumbo Rangers. A striking instance of the union which then existed among the inhabitants is shown by the fact that on a certain Sunday, the Lisburn companies paraded in full dress and marched to Mass, where a sermon was preached by the Parish Priest and a handsome collection made to aid in defraying the debt on the Mass House. It is recorded that "large numbers of other Protestants attended". Unfortunately such a happy state of affairs was not destined to continue, and later on the town was the scene of many a conflict. It was here that Henry Munro, one of the leaders of the Irish rebels, was publicly hanged in 1798: his head was afterwards hoisted on a pike in front of the Market House and allowed to remain there for several days. The picture gives an accurate appearance of the town in the latter part of the eighteenth century. The fine spire which now adorns the Cathedral was not added until 1807 but the Market House dome remains the same. The building in front - the only one that escaped the great fire which destroyed the town in 1707 - is still easily recognised. It was from one of the windows of this building that Munro was hanged. The history of the Irish Volunteers is a short one. Raised shortly after the capture of Carrickfergus by Thurot, in 1760, for the purpose of repelling French invasion, the country being at the time almost denuded of regular troops. Their strength in 1782 was estimated at 100,000 and 130 pieces of artillery, but this is probably, in excess of the actual numbers. The Commander-in-chief was the Earl of Charlemont, "the glorious man who led the van of the Irish Volunteers"
Delegates representing 34,000 Ulster Volunteers assembled at Dungannon on the 15th February, 1782 and resolved "That the King, Lords and Commons of Ireland, alone had the right to make laws to bind this Kingdom". This resolution was confirmed by the Irish Parliament on the 16th April, 1782. On the 10th November, 1783, 160 delegates, representing the Volunteers of all-Ireland, met in Dublin. Dissensions prevailed, and on the 1st December the convention was adjourned, never to meet again.